Share the post "Crunching the Numbers on Assessments: Part 1"
Disclaimer: The charts and graphs are for illustrative purposes only and do not represent the actual or projected assessment rates, tax rates or distributions for the City of Amsterdam. I posted a while ago about the state of assessments in the City of Amsterdam. In a comment from Rug City, I decided to sharpen up my analysis a bit so I’ve been working on a way to illustrate my points. I hope this proves instructive. First, we’ll use the list price of homes for sale as the market value and assume that the level of assessment will be 100%. For example, if your house is listed for $95,000 , we will establish a 2008 assessment value of $95,000 (100% * $95,000). This assumption seems reasonable as real estate list price represents an informed estimate of the market price (ultimately the sales price) and as I posted previously, the purpose of an assessment is to arrive at a market value. Second, we can find the existing assessment of the property as a matter of public record. So given the public availability of listing prices and current assessed value, we can easily calculate what the change in taxes will be. It’s sooo… simple! According to the Office of Real Property Services, the city of Amsterdam has 5034 residential parcels. Given that, how many units would I need to assess to calculate a statistically sound analysis? I’d need to assess 2278 units so I could be 99% sure that my estimates of the new assessments would be within +-2% of their market value. Unfortunately for me , I can only find 110 houses listed for sale in the city via the MLS so I can in no way reach a statistically defensible analysis as my sample size falls far too short. This shortfall accounts for my caveats and disclaimers at the beginning of the post as I especially did not want to isolate specific properties currently on the market and give any indication of a future assessment value knowing that the underlying analysis does not support the calculation. Let’s proceed anyway with the currently listed houses and let’s make a simplifying assumption for the sake of argument (and likely a heated one) that the universe of listed houses represent the city as a whole. Remember: I’m trying to illustrate the dynamics at work in assessments versus trying to calculate the ‘true’ assessments (which we’ve seen is statistically impossible with only 110 houses and also ignores non-residential parcels which also must be part of the assessment ). Before I crunch any numbers, I can see three scenarios play out related to assessments. The first scenario is a “perfect world” scenario whereby the new higher assessments create no change in taxes paid by homeowners. 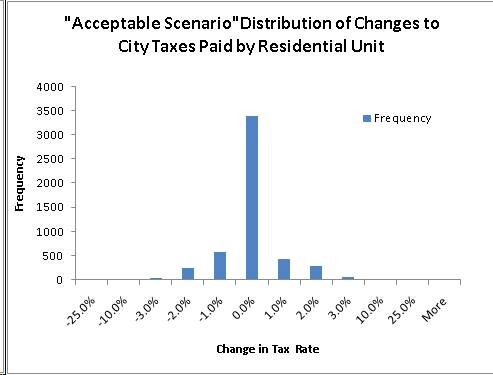 The second scenario is an “acceptable” scenario whereby the new assessments create changes in taxes paid by homeowners but the changes are within plus or minus three percentage points– in other words, most people would see no change in taxes paid while some people would pay a bit less and some people would pay a bit more. The third scenario is a “nightmare” scenario whereby the taxes paid would shift radically with a significant portion of the tax payers paying more and a significant portion paying less. To crunch the numbers on taxes paid, I’m going to use the current City of Amsterdam tax rate multiplied by the assessed value. As the City tax rate is $13.89 per thousand (excluding fees and water/sewer charges), we can calculate the taxes paid with the current assessments and with the estimated assessments after reassessments. 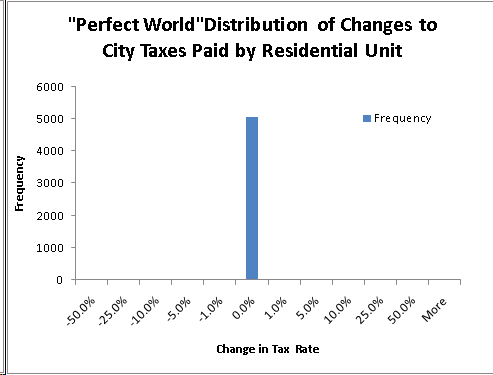 For the first scenario (“perfect world”), the distribution of changes in taxes paid looks like the chart below. This is truly a perfect scenario as no one would see any change in their taxes; the chart shows everyone with a zero percent change. In the second scenario, the “acceptability” of the scenario depends upon which side of the curve you fall. For those on the left side, they will no doubt find it acceptable as they will see a decrease in taxes. On the right side, those taxpayers will see an increase and likely find the change “less acceptable”. The key takeaway from the second scenario is that the change in taxes for most tax payers will be zero with a lower number of tax payers either benefiting or losing under the new assessment scheme. It’s here that I want to point out that the assessment “game” is a zero sum game; if I get a decrease in my tax bill, it is at the expense of someone else who now has to pay more taxes. I think this point is sometimes lost as the perception tends to be that reassessment will force everyone to pay higher taxes; that is mathematically impossible. I then applied the distribution of the change in tax levy to the universe of 5034 parcels to generate the “nightmare” chart above. Again, this is for illustrative purposes versus statistical yadda yadda. Let’s return to Mr. Chiara’s statement on the assessments from last week: “I still didn’t come up with the numbers that wouldn’t put the city in jeopardy and that’s something I don’t have the right to do,” Chiara said. Chiara claims he did the work, but he says even after multiple revisions, the new numbers would put some residents in danger of not being able to afford their homes. 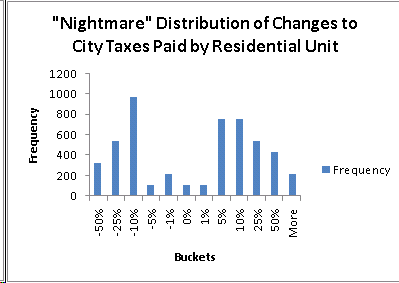 The shape of the nightmare distribution supports the points I’ve been making: 1) Taxes are not fairly allcoated as some people are currently underpaying while others are currently overpaying. Under the new scenario of assessments, the current losers will become the winners and the current winners will become the losers 2) The amount paid in taxes is a zero-sum game; in other words, if I get to pay more in taxes, then that means you get to pay less in taxes. 3) The political palatability will be quite sour as a portion of the tax payers will see significant increases. I’m a bit freaked out by the whole process as I currently feel I am overtaxed and as a result tend to be in favor of reassessments. On the other hand, if you feel you are undertaxed you will rightly and quite rationally take the position against a reassessment. But who knows for sure? Am I advocating against my own interests? Quite possibly so. The financial problem is that we now have a great deal of uncertainty in what the outcomes of assessments will be and uncertainty tends to not help your financial returns on real estate. But if we step back as a matter of policy and governance of our city, we need to establish fairness and uniformity on assessments as it now appears we have anything but. 2) Uncertainty of future property taxes– it’s no secret that financial markets and real estate markets typically do not reward uncertainty. As uncertainty rises, the market value drops as it’s deemed to be more risky especially in real estate. I’ll be posting some follow ups in response to the notion that we cannot use the reassessed figures because they were performed at the peak of the market. Hint: my analysis will show otherwise.